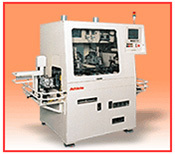 Athlete FA Corporation provides variety of factory automation system such as semiconductor assembly equipment. CB-600 is able to control ultralow load bonding comparing to ordinary flip chip bonding. It realized dramatically reducing damage from loading and stress for bump, aluminum pad, wiring, etc. Also with adjustment function following to thermal shrinkage at cooling process, it achieved high yield and reliability bonding process from preventing crack and break. In addition, this system is enable to proceed ±1μm (3σ) precise accurate bonding, which is very innovative in this field. Capable for Ultralow load range：0.049～4.9[N](5~500[g]), high load range：4.9～490[N](0.5～50[kg]) without tool exchange. ※Not able for loading control across above two range. Possible for thermal bonding with ceramic heater from room temperature to 450℃. ※Room temperature to 250℃ for substrate side. Able to set and change two kind of tool for different recipe with ATC（Auto tool changer）. Chips are set to chip tray with face down condition. Will be bonded after alignment with visual recognition. ■Compact, low price, manual type Flip Chip Bonder which is suitable for small lot production and small king of experiment. CB-505 is possible to exchange to ultrasonic head with option in addition to thermal press bonging by heating with ceramic heater. 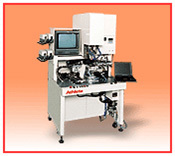 Because chip and substrate positioning are proceeded on a single screen, it is possible to achieve high bonding position accuracy, in spite of the use of manual positioning. 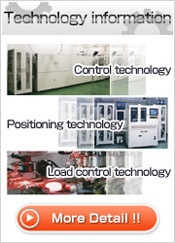 Two types of pressure loading are provided fixed pressure loading and point pressure loading. A graph representation of the bonding process can be displayed and stored, together with parameter settings, onto a floppy disk. TABs and QFPs can also be accommodated by changing tools. ■Mounting accuracy of ±3 μm. Bonding method is not only by the application of pressure or heat, but also by the application of ultra sonic. The CB-1710 is a semiautomatic flip chip bonder suitable for R&D or small to medium volume production. 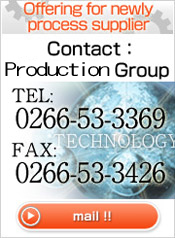 It can also be used for mass production after process decision. Auto leveling function is adopted as standard feature, made the manual adjustment of bonding head unnecessary. 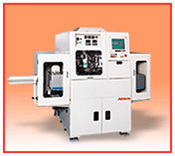 ■Full auto Flip Chip Bonder which introduces heating and pressing method and makes mounting multi chips on substrates. CB-1750 has ATC function which is available to mount multiple chips in addition to auto leveling function with standard equipment. It is possible to construct the most suitable line for mass prodution by mounting chip loader which corresponds to paste transfer mechanism, gelpack, wafer and tray. Three types of bonding are possible. Solder bumps, conductive resin and ACF. An auto bump leveling function is available. By adopting the automatic tool leveling mechanism, the tool and the substrate have a parallel accuracy of less than 5 μm. 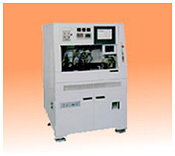 ■COF ultrasonic bonding system capable reel supply, the first in the industry. It is sure highly efficient IC driver which is essential for highly fine FPD is designated to be less than 30μm pitch in the future. CB-1800 has introduced the ultrasonic bonding process that make both capability of narrow pitch size and high productivity compatible in the early stage. It has realized an overwhelming performance in connection with our potting system which is capable system which is capable of reel to reel and has an overpowering market share. It is possible to set dispenser head up with option before bonding process. Equipped automatic head cleaning meshanism for dispenser head. In-line configuration with our COF potting system, MS-1890, applicable to under-fill application. 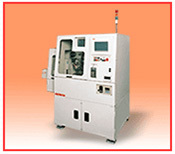 ■Ultrasonic flip chip bonder to achieve bonding with room temperature. Mounting tact time 2 second. Achieves less than 3 second including bonding process. Capable of ultrasonic bonding with room temperature which never damage bonding materials. 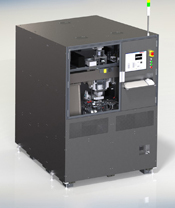 CB-1900 is the Flip Chip inline production system that is based on CB-600. The board that is carried from the loader, Resign Potting, carried out the local bonding, then stored into the un loader. Chip size 3 to 15mm sq. ■In addition to conventional grab-top potting, the MS-1820 can accommodate underfill potting after flip-chip mounting. Cutting-edge technologies such as the processing used to correct application positioning in a 3-axis needle-posting calibration system enable not only conventional grab-top potting, but also underfill potting between a flip-chip and the substrate after mouting of the flip-chip. High-precision positioning mechanism accommodates both grab-top and underfill potting. 3-axis needle position calibration system automatically corrects for needle position skew when a needle is replaced or bent. Target device data is stored on floppy disks for easy management. Point ejection and line ejection modes. Syringe heating, substrate pre-heating, main heating, and after heating are possible.